Read through some of the reviews by previous Aruba Beach Resort guests. What more can I say it was a perfect location close to everything. It was so good I didn't bother hiring a car! The apartment was spacious for a family of 4. There was a washing machine, good size kitchen and dining table which was perfect for a young family. The free wifi was excellent for being able to book activities. We were also surprised it was so quiet at night. We were very apprehensive visiting during schoolies week and we wouldn't have known there were any noisy teenagers around. The pool was a good size and depth for both young kids and adults as they have a large step that spans the length of the pool. There is also a spa for relaxing after a busy day. We will definitely be staying there again. We stayed in the one bedroom unit. It covers the basics & with shops nearby you can easily access everything you need. Unit had a washing machine & dryer so you can pack light if staying for a while. The kitchenette has a fridge, microwave, toaster, stove, oven, crockery, cutlery, utensils, pots/pans and all the basics if you want to make your own meals. A block back from the beach, walking distance to supermarkets, restaurants, coffee shops, the convention centre & the light rail system. A swimming pool, spa & bbq facilities make for a perfect day/night in. Cost $775 for 3 adults x 5 nights during Sep. Weâ€™ve rated it 4 stars but as far as budget accommodation goes weâ€™d give it 5 stars. Just spent the weekend at Aruba with my family & friends! We all had such a great time and absolutely loved the location of the resort. It's close to the beautiful beaches, shops & soo many restaurants - too many to choose from! All of our apartments were on the same floor and had such lovely views, they are clean & tidy and had everything we needed for a weekend getaway! The managers were really great and helped us with local info and extra towels for the kids! Oh and the kids loved the pool, sooo pretty in the evenings for a dip. Stayed for 3 nights, wish it was longer. Great affordable accommodation , very clean , air conditioned,good size apartments and walking distance to great restaurants, the beach and the GC convention centre. But the winner was Serena, the on site manager. She was cheerful, helpful and very accomodating with our requests. Second time we have stayed here and will definitely be back. It would be difficult to improve what is great already. From the welcome to the departure ~ Excellent ~ So pleasing to find a good bed and amenities. With connections so close, the tram ( light rail ) and the buses stop at the gate. because it's what we wanted. Very clean and tidy inside and out. All for a very reasonable price. $ = :) â™¥ it. Great location, nice rooms and friendly/accomodating mangers, highly recommend! This hotel has free car parking, excellent location - near the beautiful beach, the bars shops and close to a Woolworths. We had an apartment which was perfect for also our needs. Really clean, cozy and had all the amenities you would need. I would highly recommend it here! We stayed for a leisurely 3 night break and enjoyed our whole stay at the Aruba Beach. Friendly staff, clean & comfortable rooms, secure car park, and within close walking distance to everything. This was our third or fourth stay at the Aruba Beach and it most certainly won't be our last stay. Perfect for my needs. Simple, clean, short walk to the Expo, staff very accommodating with extending parking and flexible checkout arrangements due to my odd hours (exhibitor). Really took the stress out of being in town on business. Location was also excellent for restaurants, beach, cafe and tram, all an easy stroll. Thank you! We stayed here for a week in November 2016. The hotel is just a few hundred meters from the beach and shops and restaurants are just across the road. We arrived at night and the front desk was closed so you had to get you're key out of a box at the hotel entrance. The room had everything that you would need and was spacious and clean. The pool was very quiet through the week which suited us as you could get a sunbed easily. At weekend the hotel had more guests but we still managed to get a sunbed easily. Would recommend this hotel for a short stay as it was clean and had everything you could need. Attended a conference at the Gold Coast Convention Centre during Sep and the location was just spot on. Able to walk to the conference everyday, pop back when needed too and happy with the facilities. Great pool for a dip to start the day and to take the edge off a long day. Just had a small room, but it had all that was needed. Clean tidy and everything worked as it should. The undercover parking was free and secure. Access to the Broadbeach restaurants and other shops was just a step out the door. I shared a room with a friend for 5 days which worked out to be 50pp/pn. The studio room was complete with linen, basic cutlery and tea making facilities, a microwave and a fridge. There is wifi and Foxtel which is more of a necessity than people realise. The upper rooms have to be accessed via stairs as there isn't a lift. Ample underground parking. Friendly service staff who offered to mind my baggage between check out and airport transfer. The rooms do not get serviced so you do have to go to the mall and get your own toilet paper and other necessities. Overall a great apartment stay that's super close to the convention centre. Would come again the next trip! So.... This hotel has mixed reviews and I can only comment on my stay. The apartment from the outside is neat and tidy with a pool etc and well looked after gradens. The apartment we had, had everything I would expect including cutlery, appliances, etc.... The decor was dated but was tidy and clean. A small amount of supplies are there, couple of loo rolls, washing stuff, tea, coffee and milk.... But as its self catering its your job to resupply as needed. That's not hard though as the best thing about this place is location! Fanstastic..... Close to everything from pubs, restaurants, cafes, and shops.... The tram and bus stops are very close too! I would be back again! I've just this day arrived back in the UK after spending 2 weeks staying at Aruba beach. Fantastic apartment, already looking at dates for a return visit later this year. Stayed there for a couple of nights with my sisters and loved it . Right in the centre of Broadbeach! Been there with my girlfriends, lovely place to stay! Love this place, would recommend to anyone! Great rooms and lovely managers. Can't wait to get back there. 5 star - Had a very enjoyable stay on the weekend, I look forward to returning one day. 4star - We have stayed here every year for the last 10 years - love it. So central to everything - good value for money - good facilities - good managers - highly recommend! 5star - I have stayed at Aruba a couple of years ago with my partner and my daughter and her dad also stayed last year.. we all love it .. great location and lovely resort! Cant wait to come back! Came up for a weekend of AFL, and checking out the restaurants & beaches of Broadbeach. Aruba Beach Resort is the ideal location to stay, just a few minutes walk from everything you want. The 1 bedroom apartment was just perfect for our stay. Very friendly management & I will definitely stay here again. My wife and I were very pleased we selected Aruba Beach. It more than met our expectations and we can see why it gets such good reviews. Our unit was very nice and spotless. The managers go the extra distance to make sure all our needs are taken care of and they are very friendly. We loved the heated pool. Dining out was great as we just had to walk across the road and we could use resort vouchers and get a free meal if we paid for one. This resort is well cared for and we would strongly recommend it. I enjoyed staying at this resort more so than any hotel I've ever stayed at. The managers are incredible, and bend over backwards to help with any request. I've never been to the Gold Coast before this but I will definitely be back thanks to this wonderful property. Amazing location, very close to Broadbeach shops, and tourist attractions. A hidden gem! I would recommend this place to anyone who enjoys having amazing customer service and beautiful rooms! I would class this accommodation as a wonderful experience!! The facilities were first class, kitchen was fully stocked, and the view from the balcony was great! Set in a prime location with everything close by, the manager and his wife were so friendly, and they helped us every time we had a query about something. I am highly recommending this resort to those who are planning to visit Broadbeach. Thanks so much for all your help during my stay. You have helped make my stay an awesome experience. Complex is set in immaculately kept gardens right opposite a variety of quality restaurants and just a few minutes walk away from Broadbeach's main shopping centre and beautiful beach. 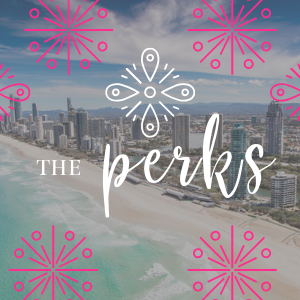 I believe what sets this resort apart from others on the Gold Coast are the fantastic hosts who are dedicated to making your stay the best it can possibly be. They are genuinely interested in you, love sharing a laugh and nothing is too much trouble. What a wonderful place to stay. In our two week visit to Australia this was by far the best hotel accommodation in which we stayed. It was almost like being at home and the staff we met were warm and friendly. I will have no hesitation in recommending the Aruba Resort to my friends and colleagues. I will also pass my recommendations to my agent who arranged it all. To the owners/management - well done; what a pleasure to have used your facilities! What a great place.. Cheap, clean and as they say location location location.. This place is right dead smack in the middle of Broadbeach... walk out the front door and you're amongst it.. Managers are very friendly and always have a smile. On behalf of my family I would like to say thank you for all the help and support offered right from the booking time to check out. Our stay at Aruba Beach was very relaxed, comfortable and the room was very clean, neat and welcoming. In case if we do travel to Gold Coast in the future we will look into staying there again. Close to beach, restaurants and transport. Clean rooms and grounds. Friendly staff. Fantastic location! We loved Broadbeach and could walk to all the cafes, restaurants as well as the beach. Our hosts (Gail and Alan) were really friendly and helpful. Our unit was clean and comfortable. We have already booked our return visit next year! Stayed for two nights in a one bed apartment, the central position is great as you can walk everywhere in minutes. Really helpful managers who kept the whole site in immaculate order. We have recently stayed at the Aruba Beach Resort and found it to be very clean and tidy. The place is in a great location near restaurants and bars and just outside you can catch the bus to Sea World. The pool and spa were excellent very clean and the spa temp just right. We often had breakfast just across the road at a restaurant called Sage during the week. A full breakfast will only cost you $8.95, and just a short stroll away you are at the beach. This place can't be matched for location-bus outside, surrounded by cafes and restaurants, shopping malls close by and the beach across the road. The resort is very well maintained-the pool and spa were just the perfect places to relax and unwind. There is even a poolside barbecue for your use. Hosts were helpful and friendly, advice on best places to shop and the correct buses etc. We will be back. Just the ideal accommodation when attending a convention. Only a short walk away with lots of eating places nearby. What a great location! Just loved the shopping and restaurants nearby. Thanks Gail and Alan - you were so helpful. Really loved the pool. We spent a day at Pacific Fair which was only a short walk away and made the most of the barbecue facilities. With a supermarket almost on your doorstep it was easy to prepare some salads and enjoy. What an idyllic setting. We'll be back! Couldn't believe the choice of restaurants, cafes and bars nearby. A perfect holiday with the beach just metres away, it was a grand way to spend a holiday in your Australian sunshine. Thank you.